Self-described as a sort of ‘Cliff’s Notes of fairy tales’, these are short, pithy précis, coming interlarded with what in a British writer would have been an ironical style, but coming from a very American pen and sensibility, becomes a dry, sardonic humour. 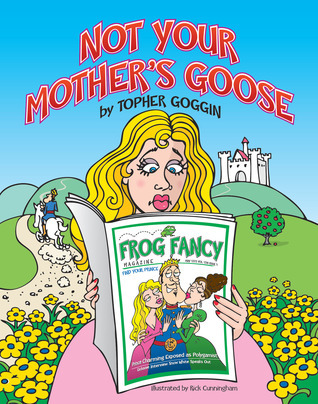 Goggin makes no bones about leaving his own ideas and comments on the activities of well-known fairy-tale characters, and to spice up proceedings adds a large side-order of sauce; street-smart sass that actually for me fell unfortunately flat. It is just so American in voice and presentation, featuring jokes the punch-line of which utterly escaped me by being some very American detail I wot not of, that although I giggled at certain positions and had a jolly time of it, I felt as if this book was just not aiming for an international audience, and did not care to. Like watching American TV: one can learn the style and the lingo, but it still feels like a place apart. A fairy-tale place that is not quite real. Ironically, American popular culture output is itself a sort of Cliff’s Notes of American life. Just do not rely on Goggin or American TV to answer exam questions on deeper cultural constructions. Goggin’s whole-heartedly gung-ho approach made for some sparkly fun, and this was a quick, light and easy afternoon’s read. In between, Goggin and his illustrator Cunningham have a ball presenting us with newspaper articles, spurious adverts and cartoons all relating to the characters of the tales—pre, during and after the events that are so well known. It flattens the bubbly fun out like toothpaste on paper to describe it as such, but, in black and white, that’s what is in this book. The zippy fun is all in the reading. Too little said? Too vacuous an article to make a choice on the matter? Then I’ll take a leaf from Goggin, and—Hey, bite me, I’m the reviewer. I told you what it is and how it’s done—job done! What might Goggin make short work of next? I’d pay good lucre to see the Brontes or Dickens rendered thusly. Although many have made fun of classic texts, and despite that moderately alienating American-ness of Goggin’s, it actually makes the result all the more of the current gestalt; capturing the lightening of modern preoccupations with celebrity and social positioning and bottling it with gusto and verve.